Cortines, who has wasted no time issuing new directives to the staff that he inherited this month from John Deasy, relayed the decision today in a letter to employees, a copy of which was sent to LA School Report by a district staffer who asked not to be identified. 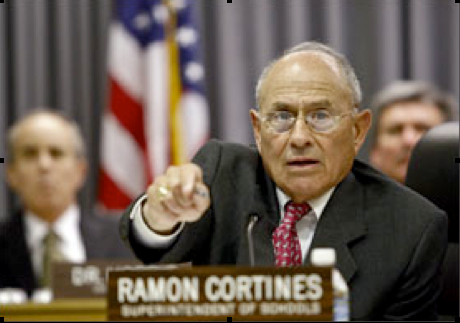 In the letter, Cortines expressed clear frustration about the growing number of absences by teachers for professional development and other reasons. “It has come to my attention that the number of substitute teachers requested for professional development during the school day has increased dramatically in the past two years,” he wrote. “We must stay committed to doing the work necessary to increase student achievement and must remain in schools and offices to do so,” he continued. The ban comes just a day after Cortines announced the district’s top priority is to fix problems with MiSiS that are making it difficult to print student transcripts. “I’m glad to see that the superintendent is redirecting critical resources to the most important functions of the district,” board member Tamar Galatzan told LA School Report. It is unclear how teachers and the teachers union feel about the moratorium, or if the subject came up in a meeting today between UTLA President Alex Caputo-Pearl and Cortines. UTLA did not respond to requests for comment. Lydia Ramos, the district’s communication director, explained some training sessions outside classrooms will continue. “We still have some Common Core standards training that we are doing and those would be the exceptions,” she told LA School Report. “[The superintendent] is looking at this as an opportunity for everyone to come together and stabilize our schools and help where we can help,” she added. The suspension takes effect immediately and will remain in place through Jan. 31, 2015.